How emotional training disadvantages both genders. I guess I am writing this article because I live in a country which is about 20 years behind on gender equality. It’s something that I have often thought about because the men and women of my generation are not as subject to what I am writing about as previous generations. One of the differences that is often commented on about men and women is about emotion. There are numerous books on the topic. Many societies around the world have this believe that men are unemotional and women are emotional. I assume I am not saying anything new here. What I have noticed though is two things. One, this difference is one our societies have created. And Two, it is a huge disadvantage to both genders and our society as a whole. Firstly, to suggest that men are naturally unemotional is a ridiculous position to take. Men are taught to be unemotional. They are pushed in that direction. I am in no way arguing this is necessarily a bad thing, just pointing out that this is something many societies teach their men. However, they don’t seem to teach that emotions are natural. On the other hand women are taught to embrace their emotions. They are taught to care for people and to care for themselves. They are pushed in that direction. Since men also have emotions I would argue that emotions are a natural part of the human experience. Men are pushed away from that experience and women are pushed towards it. This is a huge disadvantage to both genders because it creates an unnecessary gender gap. It creates a difference in perspective that is so huge that both sides struggle to understand each other. Men accuse women of being overly emotional and women accuse men of being insensitive. This creates problems for both genders as there is a wall that society has built between them. Personally I think the disadvantage in this case is greater on the men’s side because they are never taught the language needed to talk about feelings and emotions. They are never taught how to deal with an “emotional” person. This puts them at a disadvantage in every field of human interaction as you need to have empathy and sympathy to be able to be part of society. I mentioned in the title that it is a disadvantage for both genders though. Being pushed in the direction of embracing emotion wholeheartedly opens women up to greater emotional vulnerability. Being taught to shield your emotions or put off your emotions until there is time to reflect is actually a useful skill that men are taught. For me it’s not a matter of one or the other. It’s a matter of realising that emotion isn’t a difference between the genders. In which case we should ask, is it beneficial to have this artificial difference? We should also decide which direction to go in. We can teach all humans to be emotionally distant. We can also teach all humans to be in touch with their emotions. I personally think it needs to be somewhere in the middle. Where we know how to distance ourselves and how to be in touch. Ten years ago I read Zen and the Art of Motorcycle Maintenance. An autobiography that has nothing to do with Zen Buddhism or Motorcycle maintenance. The story is a reflection by the author on his own mental breakdown when he was much younger. The story contains many philosophical discussions of great interest to me when I was much younger. One of the stories has always stayed with me. That story was about a great machine. A machine the size of an entire country. That machine does everything for the people in that country. They live in it. They get food, drink, clothes, entertainment from it. The machine gives them work to do, educates them on how to live and so on. This country sized machine is very old. Older than anyone remembers. It’s so large and complicated that no one understands how it works. One day the machine stops making clothing. The people look at the part of the machine that makes clothing and try to understand why it isn’t working. Half of them notice that seventy percent of the machine looks different to the other thirty percent. They conclude that in order to make the machine work again they need to make that thirty percent look like the other seventy percent. Meanwhile the other half of the people argue that since the machine isn’t working than the seventy percent must be wrong and the thirty percent is right. Both groups start trying to fix the machine. I’ve retold this story to a number of people. They’ve always replied to me that people would know how to fix the machine. They would recognised damaged parts from non-damaged parts. On a surface level this is true. You can tell the damaged parts of a car from the non-damaged parts of a car when you’ve had a crash. What about internally though? Can you be so certain you could fix your car if it stopped working? Would you be able to identify what isn’t working? You may wonder, why did this story have such an impact on me. So far it is the best analogy I have ever heard for society. Society is like this machine. A giant system that we are all part of; that clothes us; feeds us, and gives us education and employment. It is a giant system that we don’t truly understand and for many people don’t question. As a system though it is much harder to fix or to discover if there is something wrong. In the above analogy they noticed something was wrong because there were no longer any clothes. What if it was something far less obvious. Something like the food changed quality, or the children being educated in the machine didn’t know anything? That is when the analogy comes closer to society. We may notice the problems but our way of fixing them is not so different to the people fixing the machine. It is often just a surface repair that doesn’t seek to understand the true cause of the problems. That said, one of the problems with the analogy is that society is actually always changing. Society is not a ten thousand year old machine, even if that is often how we see talk about it. If it was then my generation would look no different to the previous one and the one before that and so on. There would be no change. You would be able to place me in any era and I would fit in. We know that isn’t true so why do we delude ourselves with the idea “We’ve always done it this way.” Every generation improves on what the previous generation did. Every generation looks at their experience and says ‘I didn’t like that part, but I liked that part, let’s make a society in which that part I didn’t like isn’t there.’ This occurs in a reflective way but it also occurs in a reflexive way. It is part of being human and part of the systems that connect us and our collective experience as social creatures. The curious thing is how each generation seems to take the changes the next generation make so personally. They insult and degrade the next generation because it doesn’t match the society they were trying to make. They don’t want the next generation to make changes. They want to make the next generation just like theirs. If you seek to create no change in the way society functions then I think you will create that world where no one understands how the societal machine works and when a problem occurs will fix it in ways that cause more harm. 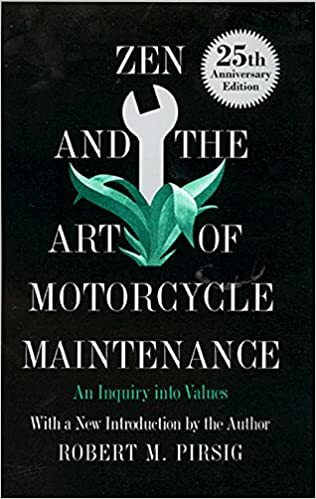 I’m glad I read Zen and the Art of Motorcycle Maintenance even if that is the only part I remember of it. A mental model is the way we think about the world. They are beliefs, values, thoughts and feelings that we have about the world that have come from our society, our culture, our family and our friends. They are things that we don’t question because they have become part of who we are. This isn’t a bad thing. It is part of being human, however it is important to understand our mental models so that we can choose which models are the best for us. For example, I am Australian so I am very flexible about time. I am currently living in Japan which has a very rigid perspective on time. Since I am living in Japan I have found it essential to change my mental model knowing that if I don’t I will upset the people around me. An amazing part of travelling is that you get a chance to question those mental models. When we visit another country we see a country with a different set of mental models. Some are similar to ours but there will always be differences. When we come into contact with another culture we can reflect on our own and learn more about ourselves and how we think about the world. Not all of us can travel though, but we can still learn a language. A language is a form of mental model. It holds the way a group of people see and think about the world. In learning a language we can learn about different ways of seeing the world. In doing so we can understand our own life and upbringing. In this we can come to better understand our culture. We can appreciate the cultural ways of thinking that bring us a happier life and we can shed the ways of thinking that haven’t. One of the interesting things about learning English is that it holds a wider range of perspectives than usual languages since it is truly a global language. Every nation with English as its national language has its own unique culture that changes the way English is used. Australians, people from the US, Canadians, New Zealanders, South Africans, Singaporeans to name a few all have their own mental models. You don’t just learn about one culture or one way of thinking. When you add that to the number of countries that learn English as a second language then you really gain a sense of just how many cultures are contributing to the mental modes available in English. This brings me to the second part of this article’s title, high school English. I’ve been lucky enough to be able to observe the way English is taught in high schools in Japan. One of the things I noticed is that English language despite being a different way of seeing the world is being taught as a way of reinforcing Japanese perspectives. To repeat that, the subject English in Japan is used to teach Japanese moral education. I would not be surprised to find that that our countries treat language education the same way. This means that a major benefit to learning a language, the chance to reflect on our own society and our own ways of thinking, has been removed. To conclude, when you teach a language you should include the way that native users of that language think and why they speak the way they do. In doing so we can work towards creating a better way of living in which we combine the mental models of the world’s cultures. For anyone who doesn’t watch Rick and Morty it’s an adult swim sci-fi cartoon with usually quite thought provoking story-lines. I’ll admit it’s probably not for everyone but it’s a show that I really dig. One of the recent episodes, named Big Trouble in Little Sanchez was quite a surprise for me. In the episode the mum and dad of the show go to an alien marriage counselor who uses state of the art technology to manifest the couple’s subconscious representation of the other. The premise shows the misconceptions of the other partner as horrible monsters who then proceed to try and kill each other. Obviously it’s taking the idea to it’s extreme but there is a little bit of truth to it. We do end up having misconceptions of the people in our life. Each misconception can skew the way we view a person until we have something that looks nothing like the original. The episode provoked me to dig deep and have a closer look at my thoughts and feelings towards my loved ones. It’s important to make sure that you aren’t being unfair to the ones you love. That what you think isn’t creating a monster in your mind where there isn’t one. So my wife and I are by no means rich, although i wouldn’t call us poor. We are comfortable. One value that we both agree on is good food is better value. My wife in particular gets depressed when she feels she wasted money on a meal she could have cooked better at home. So that’s what this blog is about. Value for money when buying food. When it comes to smart phones and computers people don’t mind paying extra for good quality. That’s why I-phones are so popular. You may pay an extra two hundred for it but you feel like you have bought something that will last and is better than the competition. Likewise with apple computers. In this department I’m happy to go for a cheaper computer that meets my needs. Food is a different matter though. Take two restaurants. One restaurant costs an extra five dollars. Both restaurants serve the same type of food but the cheaper one is lower quality. In my experience many people will go to the cheaper restaurant and comment about how much better the restaurant is than the other one because it’s cheaper. From my perspective though the cheaper restaurant is in fact more expensive. We will often lament the waste of money and wish we’d gone to the slightly more expensive restaurant. Why? It is a better meal which makes it better value. It’s a meal we couldn’t have just cooked up at home. We go home happy we had the meal and are even happier to have some leftovers for the next night. After all that is the point of eating out. To get something that you can’t just cook and enjoy good food. We live in the age of media addiction. Find me a person who isn’t addicted and I’ll show you someone who was born ninety years ago. Whether it’s TV, computers, smart phones we all want it. So what about the next generation? They look to be primed to experience instant media gratification at any time. Thanks to Youtube and smart phones, if you have a whinging child you can just chuck their favourite show on and plant them in front of it. Is this a good thing though? My first daughter is a media addict despite our best efforts to avoid it. If it was up to her she’d watch her favourite show all day long. When she watches she really watches too. I’m not talking about having it in the background. She is glued to that screen. As a parent you may think that sounds fantastic. What a great babysitter. It’s not though. Three months ago we were having a constant battle about it. She’d beg for one episode of her favourite show. We’d relent. At the end of the show she’d scream and cry for another episode. If we relented again her behaviour and attitude would visibly get worse. It was obvious to us that the more she watched the crankier she got. It made no sense to us to let her watch anything. Zero tolerance didn’t work. She was cranky about not watching TV and worse after watching it. What to do? Our child is now two and a half. She’s reached the stage where she understands cause and effect reasonably well. It’s such a difference. So we’ve been using media as flat out bribery. We wanted her to go to bed early and get up early mostly because we wanted a break after 9. We told her if she gets up before 7am she can watch two episodes of Peppa Pig, 5 minutes per episode. Now at about 8.30 she says to us If i go to be now and get up early i can watch Peppa pig. Actually she says it in Japanese which is only four or five words. The next adjustment we wanted was toilet usage. She was going well with her toilet training but suddenly stopped using the toilet in the house. She was fine everywhere else just not in the house. So we made a chart. Every time she used the toilet we’d draw a picture of Anpanman on her chart. When she gets three of them she can watch an episode of Anpanman, 10 minutes. That means she should be able to watch at least one episode a day. On the weekend she gets a free episode of Moomin, 30 minutes. So far it’s worked really well. She says it’s time to finish watching herself and rarely asks for another episode. When she does we don’t relent no matter how cranky she gets. To my wife and I the TV is a babysitter who gives our kids alcohol and cigarettes. For our second daughter we’re trying for zero exposure to media for her first few years. After all if you don’t get exposed to it you don’t feel the need for it. What does a one year old gain from watching TV? For that matter what does a two year old gain? How about a three year old? Before you say they are experiencing language in use, think about what you are doing when you watch TV. What are your thought processes? If you are anything like me your brain is running purely on cruise control if that. Anyone who’s tried to have a conversation with me while a TV is on can attest to that. Funny thing about all this is that it makes me feel like such a strict parent. Everything you do for your child though should be factoring it what it is doing for their development. What’s better, her watching TV or her playing with her toys or with one of us? The answer is pretty obvious to me. About half a month ago my wife showed me a talk on google videos. It was by Marie Kondo you can watch it here. That talk was about her method of tidying up the house and how it can change your life. 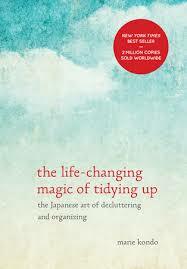 After watching her video I ordered her book The life-changing magic of tidying up. I strongly recommend reading it. It’s only around 250 pages and is very easy to read. First, decide on what your ideal lifestyle is. When she says this she means specific day to day items. For example I want to do morning exercises everyday. You then have to ask why repeatedly until you get to the very crux of your ideal. Basically why you think that would be an aspect of your ideal lifestyle. It can’t be vague. For example I want a glamorous lifestyle is too big picture. You’ll have to break it down into smaller bits. Next, get all the clothes you own in the house, every single item and put it on the floor. The idea is that it stuns your brain to see just how much stuff you have. Pick up every item one by one once it’s on the floor and ask yourself if this sparks joy in your life. If it doesn’t have the spark of joy throw it out. If you want you can subcategorise this so that you’re dealing with only shirts, then only pants, etc. I just did it all at once. You then do this same process for every category of item going in this order; clothes, books, documents, misc, memorabilia. For books she suggests don’t keep a book just because you haven’t read it. There’s a good chance that you only bought that book to teach you that it isn’t to your tastes. The decision for books is the same as the clothes, does it spark joy? If you have books that you need for school or work that don’t spark joy she says to talk to the book about why the book is important and why you need it until it does spark joy. Be careful though, don’t just talk all your belongings into being joyful for you. The decision is meant to come from your instinct not from your reasoning. You can reason anything into usefulness. This will work against you though. For documents she says you only need two categories; need to do now and need for life. The first one is documents you need to do right now. The second is documents you need for life such as birth certificates, diplomas and so on. Throw everything else away. If you really think you may need it but aren’t sure you can always scan it into your computer. For memorabilia she stresses the importance of not holding onto the past. It’s not about whether the thing brought you joy. It’s if it brings you joy now. Treasure the memory and let things go. She says a lot on this topic. Once you’ve finished deciding on what you want you then decide where things go. She stresses the importance of putting everything in the same place. Don’t scatter your possessions around the place. Have one place for books, one place for clothes, one place for electronics etc. This way you can keep track of what you have easily. After all this you will have a house full of things you love and only things you love. This is a very powerful thing. My wife and I have been going through our belongings for the past three weeks, we have two kids so the process is a bit slower than it would be if you didn’t. So far we have thrown out around about 10 rubbish bags full of stuff as well as done five trips to the recycling shop. Over the weekend we did everything to do with the kitchen. Now our kitchen is ridiculously neat and clean. We threw out so many things that we didn’t even know we had. Please note though, this process isn’t about throwing things out. It’s about deciding what you want to keep in your life. We haven’t finished yet but already I am happier for it. I strongly recommend watching the video, reading the book and doing it immediately. Don’t worry this is a once only event which will inform you of what you value, who you want to be and what you want to do.